Ever since I had heard about white peacocks roaming its hills, I had been dreaming of visiting Olympos. 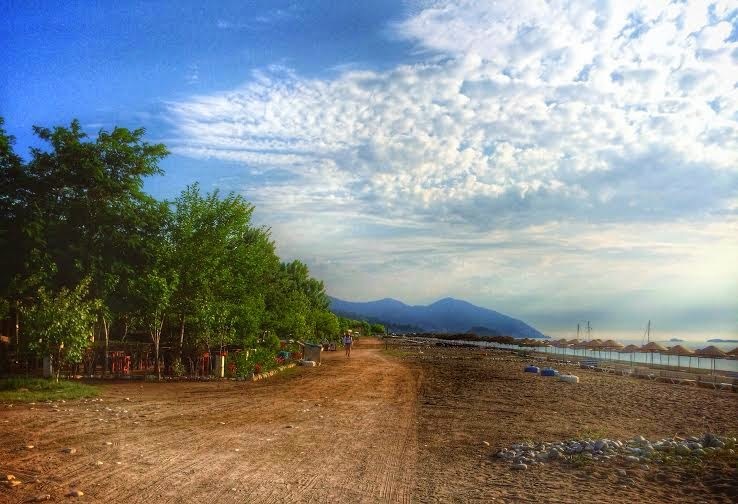 My friends who had visited had told me about the restaurants that lined the shore line and its beautiful beaches but what they had forgotten to mention was how the blue of the Mediterranean was perfectly complimented by the surrounding majestic mountains. 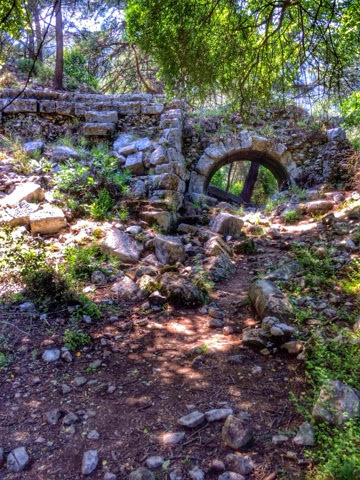 In the end, peacock or no peacock, the ancient city of Olympos was a magical adventure. We arrived at our hotel in Cirali, late at night, having driven from Phaselis, which is half an hour north of Olympos. 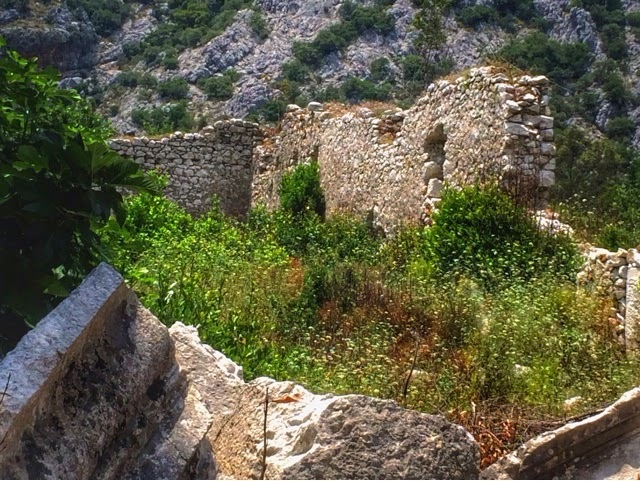 Cirali is the little village situated right next to the ancient city. The area is very popular with families as well as students due to its a little out of the way location and reasonably priced pensions and tree-houses. We stayed at Hotel Odile that provided clean accommodations with a great variety of options from regular hotel rooms to poolside, private bungalows. 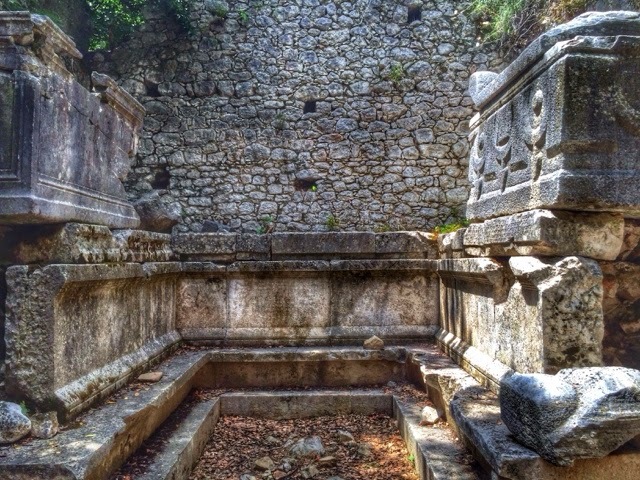 One of the best parts of Cirali is the unique and easy access it provides to the ancient city of Olympos. Although we had been told about the close proximity, being afraid of the heat, we made the mistake of driving which ended up being a half hour journey that involved going back on the highway and then driving down winding mountain roads. To my utter disbelief, when I walked down the beach the next morning, it took me only fifteen minutes to get there. You just have to make sure to have the proper foot-gear that should be light enough to take off easily (when you have to cross the river) while being sturdy enough to walk on rocky, wild terrain. 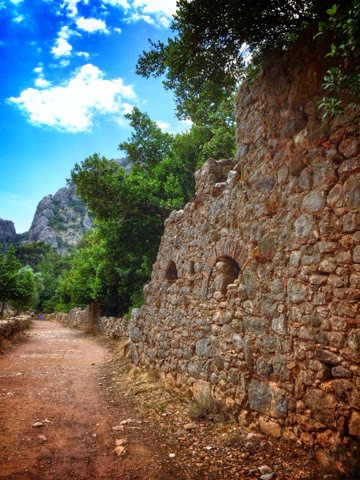 I found the most striking feature of Olympos to be its natural beauty. 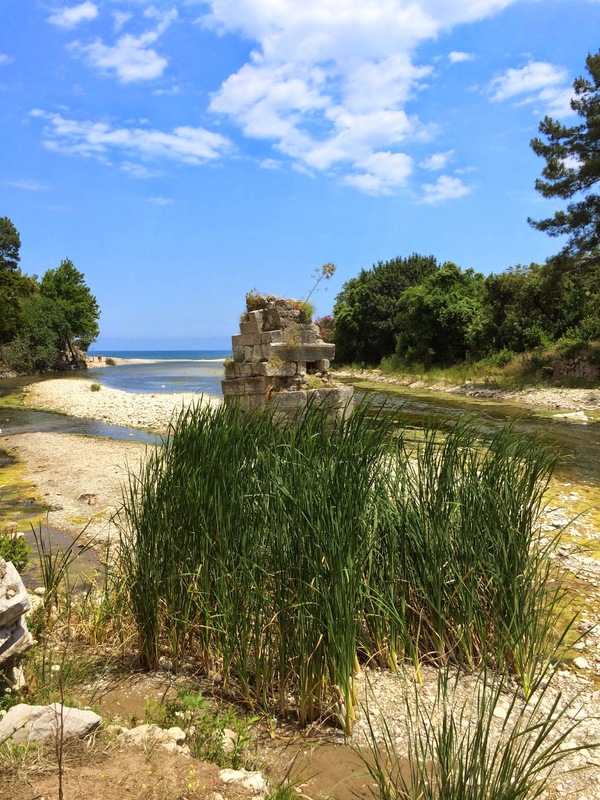 The euphoria of walking among ancient ruins in an almost virgin landscape is accompanied with the musical echoes of water as it travels downstream towards the sea. While looking at Akcay creek that runs down the middle, dividing the North and South part of town, one can discern the topography of the area much better. Since we arrived by car, we started our exploration on the North side of town. 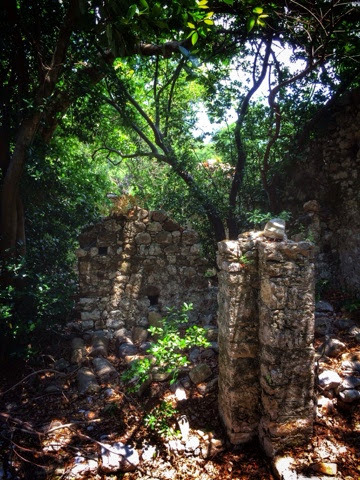 As with many other ancient cities in a Turkey, Olympos has a multi-layered history, starting in 2000BC, with the infamous band of pirates known as the 'Lukas' gaining importance in the region; their name is thought to have evolved into 'Lycia' giving the region it's name. In 600BC Lycia came under the rule of Persians till it was 'freed' by Alexander the Great in 344BC and subsequently came under the dominion of Alexander's Generals. 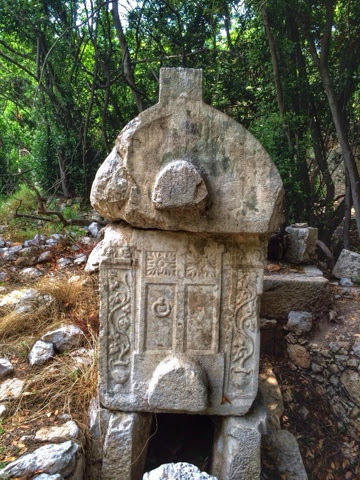 It is assumed that the lower Olympos must have been the harbor of the Hellenistic settlement on Mount Musa, a 568 meter mountain to the south of Olympos that was considered to be sacred due to its proximity to God. 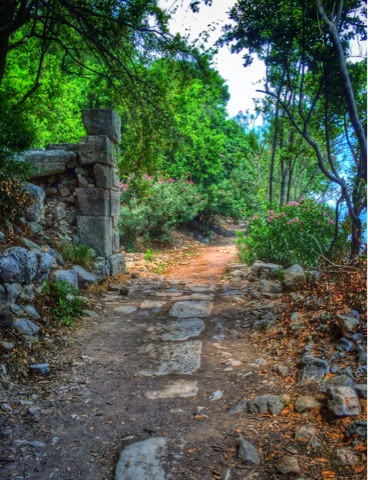 There are ancient roads that connect Olympos to the mountain. Lycia was 'freed' by the Romans this time, in 167BC. 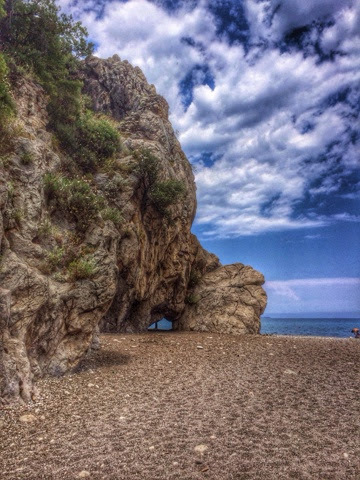 Olympos was home to Cliccian brigands who were plaguing the Eastern Mediterranean. Considering the topography and how ships are though to have come all the way from the sea into the city using the creek, it must have been the perfect location for them. Pirate- chief Zeniketes who is thought to be from the area, ruled Olympos for almost 20 years till 77BC when Rome sent Servilius Vatia to get a grip on the situation. 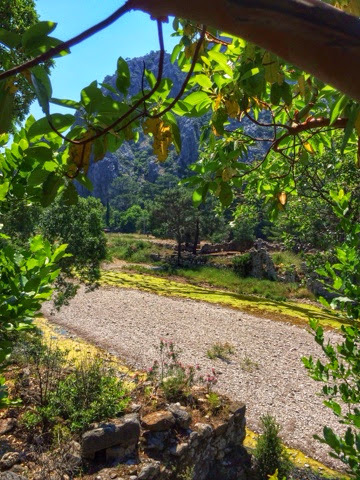 Akcay (Olympos) Creek that runs down the middle of the port city. 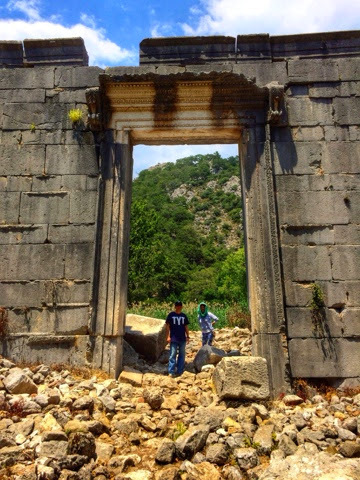 According to Strabo Olympos was one of the 6 cities of the Lycian league with 3 votes, representing East Lycia. Archaeological evidence points to a lot of building activity during the rule Romans but the city suffered two major earthquakes in 141 and 120 AD. The excavations of what has been identified as the Roman Temple have revealed a statute base with an inscription honoring Emperor Marcus Aerilius. This portal was incorporated into a complex of structures including 'Church A' with different functions. 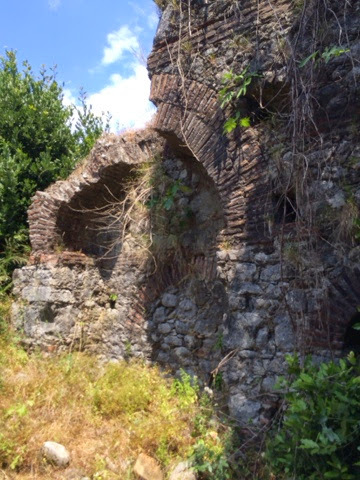 The exact function of the structures is not known but what has been identified as 'Area A' encompasses a 5th-6th Century Church as well as the monumental portal of the Roman Temple. During the Byzantine empire, the bishop of Olympos, Aristocritus attended the councils in Ephesos and Constantinople. 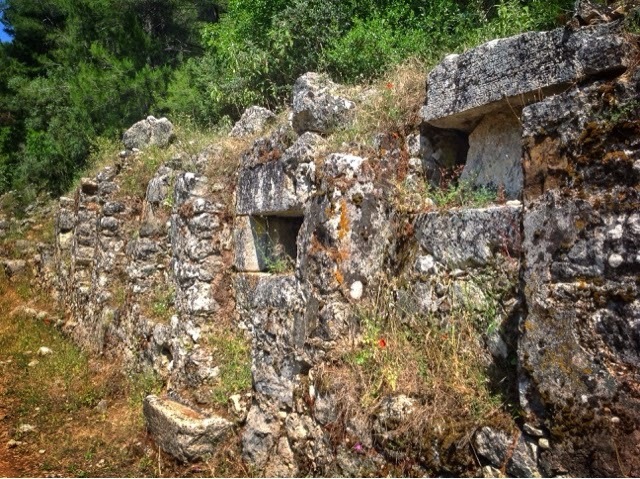 There is a structure that is labeled as Building with Mosaics which is situated in an area used as a necropolis during Hellenistic and Roman times; the 5th - 6th century structure is suggested to have been the Bishop's residence. Building with Mosaics, Bishop's Residence? While taking the path leading to the Building with Mosaics walking on the wooden bridge and rickety passes over the canal with wild, rushing water can be very exciting as well as a cooling relief from the summer heat. Following the signs for the Monumental Tomb takes visitors on a cool and exciting journey, first to the the Tomb of Lyciarch, a chamber with three sarcophagi positioned on a platform above ground and then to the the Sarcophagus of Antimachos. 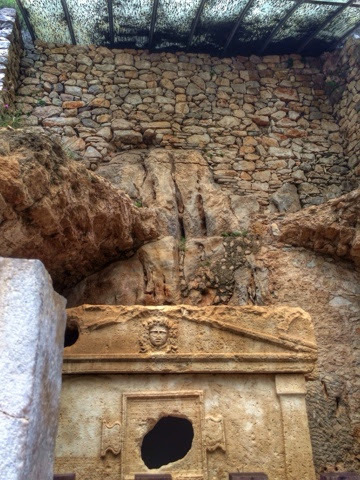 The Monumental Tomb belongs to Lyciarch (head of the Lycian League) Marcus Aerilius Archepolis and his family. 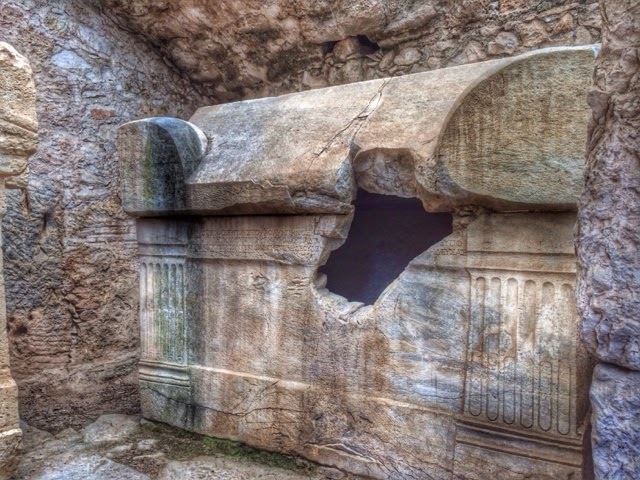 The Garland sarcophagus is imported from Prokennesos (Marmara Adasi) and according to the inscription they date to the 2nd half of 3rd century AD. 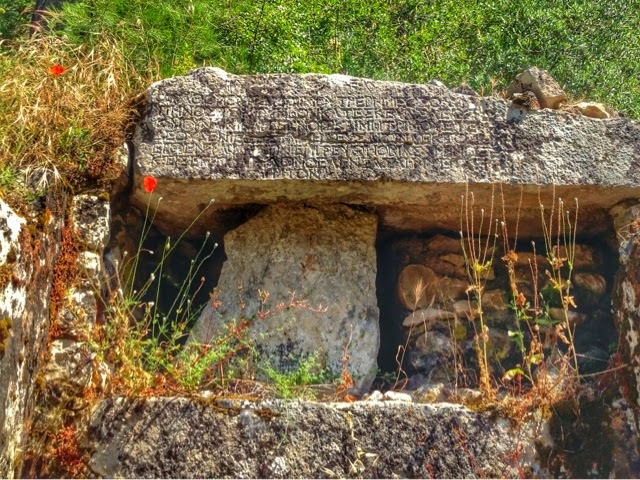 The Sarcophagus of Antimachos, 2nd century AD, has the Lycian type lid with a relief of a pseudo-door, representing the symbolic door to Hades carved on the short end, and the tree of life, a motif that had been used in Anatolia for centuries, in the corner. After exploring the tombs in the North Necropolis and the Building with Mosaics, visitors get back on the path next to the creek leading towards the sea. 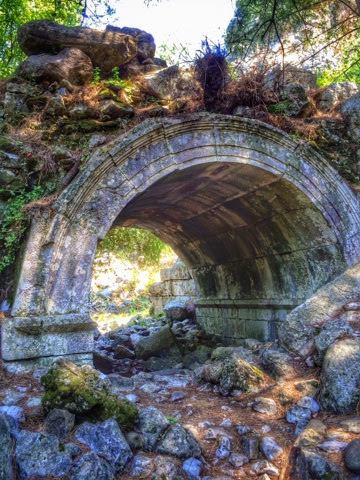 There used to be a bridge that connected the two sides of the ancient city in Hellenistic times, it is still possible to see one of the supports on this side of the creek. 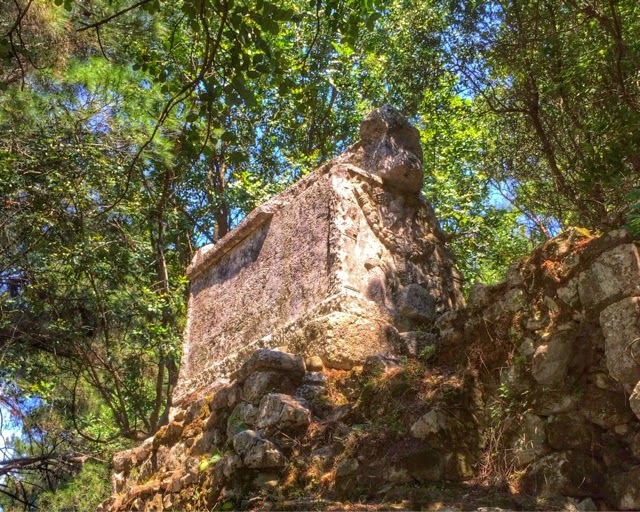 A little further down, right before one reaches the sea are the Harbor Monumental Tombs, the most remarkable of which is the Sarcophagus of Captain Eudemos. A relief of a ship and the inscription "I, Eudemos, know from my captain ship, the way between the waves from one Pontos to the other..." reveals the identity of its owner. The Monumental Harbor Tombs are the last stop on the north side of the city before reaching the sea. This is a perfect time to sit on the beach and go for a swim in the cool,waters of the Mediterranean since you can't cross over to the southern part of the city without getting your feet wet anyway. The cities medieval past is still hidden in the Acropolis on the northern side and the Southern castle or 'Ceneviz Castle'. According to scholars the way the structures have been built with walls starting at the sea level and the towers facing the mountains as opposed to the sea front, it is highly unlikely these were made as fortifications. It has been suggested that they were probably the buildings of a religious community like a monastery. When we decided to go back to our starting point following the 'path' on the Southern side of the city our visit took on a very adventurous bend. As it turned out,my here was no path, none that we could find anyway. We ran into random individuals or little groups that we questioned about the path who told us "Yes there is a path, it's just a little overgrown." They seemed the types who were very comfortable in nature and probably locals - in my opinion, you need a machete to find the path. 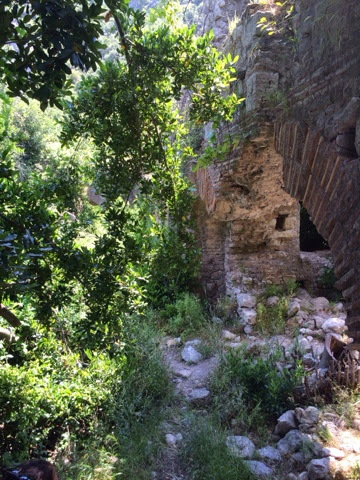 We ran into some ruins that had been labeled as a Roman bath. 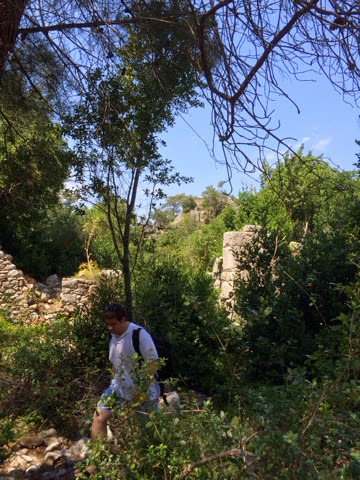 As we made our way further and further into the wild, overgrown ruins of Olympus, walking (hopping over) crumbled buildings, trying not to sprain our ankle became a top priority. But we were determined to find the Theater that was labeled on the map. We finally found the remains of the Roman theater which had probably collapsed in the earthquake of 141AD. 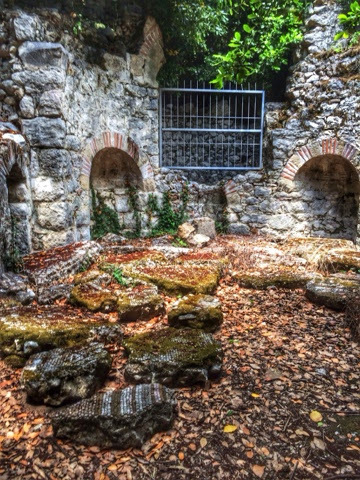 Since a Lyciarch lived in the city, they must have restored it at some point but there were other earthquakes that must have been the cause of the ruins we found here. One of the most interesting things about the theater is it's location next to the necropolis; it has been suggested that they may have used the necropolis as a backdrop. The theater is supposed to be similar to the one in Phaselis. View of the Creek from the trail on southern side of the city. After the Theater, the rough terrain turned into a manageable trail that ran through the Southern Necropolis. 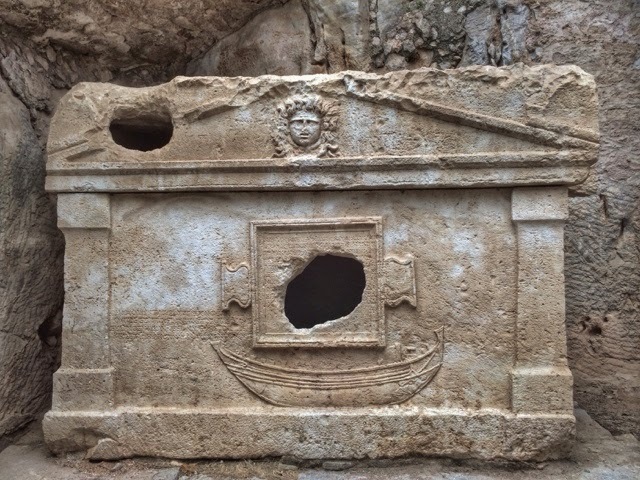 Although there were the impressive, Lycian type of sarcophagus, the majority of the graves were one or two level Roman type vaulted tombs which is attributed to the influence of the Roman soldiers quartered here after the 2nd century AD. It seems the Southern Necropolis was used in Byzantine times as well. At the end of the trail, there was one more hurdle we had to overcome in order to get back to our car, we had to cross the creek which, although dry in most places, did not have a dry path to cross over to the other side. I had to hop, skip and jump over stones and then climb over a wire fence before I could leave the ancient site. With many bruises and scratches, I came back to 'civilization' feeling like a champion - This was the most amazing experience! There is a great bookshop for the ancient site with lots of useful, relevant books including (quite impressively) Strabo's Geographica. Although I ended up buying some very unique gifts (ancient theater mask magnets anyone?) my own memories, photos and vine videos will be the best reminders of this fabulous adventure. I had not seen any white peacocks roaming the ancient site... although when I took a walk down the beach to take another look at the ancient city that had so mesmerized me, I did see two on the lawn of a hotel situated right next to the site. 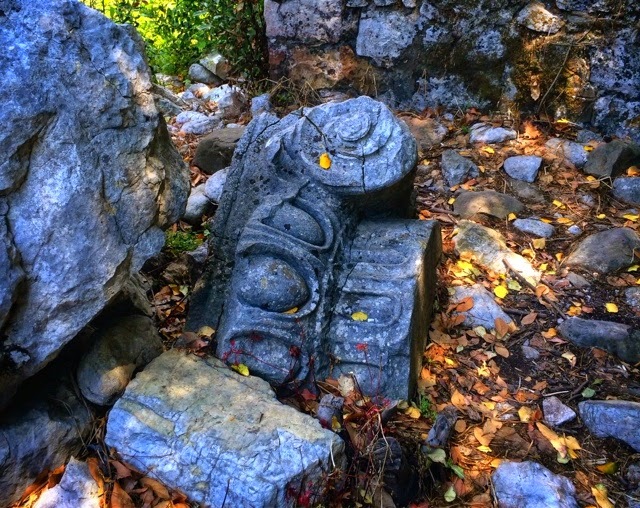 What I did find in Olympos was a great reminder of how nature contributes to the charm of Olympos. Check out the sign about Caretta Carettas above! There is a village, Ulupinar on the road between Phaselis and Olympos which has many restaurants built on top of waterfalls. They usually have a big menu with a variety that can appeal to diverse tastes. These are really worth taking a look if not for the food than to see what appeals to Turkish people as far as enjoying food, nature and views all at the same time.